Following my trip to Bangalore, I spent a couple of nights in Singapore. While it really was a flying visit, I did have a spare Sunday to kill. This, of course, could only mean one thing: a noodle crawl. 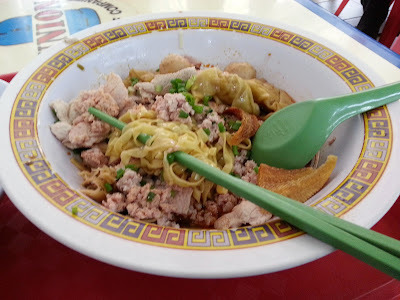 But this wasn't any normal noodle crawl, as Shu Han, author of Mummy I Can Cook, provided me with a list of noodle stalls I HAD to sample in Singapore. I couldn't visit all of her suggestions, but I thought going to three of them was feasible. First up on my itinerary was a famous stall called Hill Street Tai Hwa Pork Noodle. Having arrived just before 11.30am, I thought I might miss the lunchtime rush. How wrong was I. In the end, I didn't get to eat my noodles until 12.50pm. I was going to go for either the S$6 or S$8 priced bowl, but having queued for so long I went for the large S$10 bowl of bak chor mee (肉脞面). Given the length of time I queued, I was kind of cursing Shu Han. However, any ill will I may have had towards her soon dissipated when I tucked into this sumptuous dish of springy broad mee pok noodles (面薄) in a spiky mix of chilli and vinegar. The generous toppings of ground pork, sliced pork, meatballs, wontons and bits of crispy fried fish were good quality. (I asked for no liver, as I'm not the biggest fan.) On the side was a bowl of seaweed soup that I used to loosen up the noodles that can clag. With hindsight I should've asked for more chilli, but overall this was the finest bowl of noodles I've sampled so far this year. I was ahead of schedule when I left the hotel but I was now some way behind. Having heard that the Hill Street Fried Kway Teow stall often sell out early, I decided to change my plans and headed east on the MRT to Bedok New Town to sample their char kway teow (炒粿条). Yet again there was a queue, but mercifully I managed to get my noodles by 2.10pm. I'll be honest. 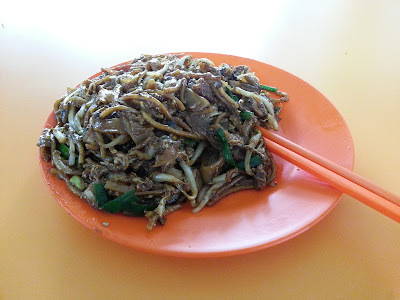 Char kway teow isn't really one of my favourite noodle dishes, but this version could change my mind. It really did have the breath of the wok (鑊氣 wok hei) with a perfect balance of smoky, sweet with a hint of chilli heat. I went for the small S$3 portion, so there weren't as many cockles and Chinese sausage as I might have liked. This version had some egg noodles as well as ho fun rice noodles in the mix, but my favourite part of this dish were the crispy bits of pork fat. Mmm, pork fat. After this second helping of noodles, I was a bit full. And having travelled so far out to Bedok, I decided to go for a stroll around the town centre. This would prove to be a big mistake. 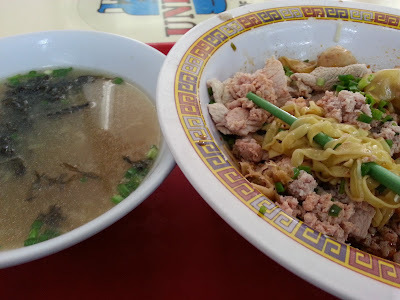 I thought I had time on my side, but by the time I rolled up to the Old Airport Road Food Centre, it was too late, too late to try the noodles at Nam Sing Hokkien Fried Mee. The guys at that stall had sold out of stuff by the time I got there. I felt that I had failed in my noodle quest, but then a phoenix rose from the flames. Well, more precisely a crumpled bit of paper with Shu Han's noodle tips on it. On there were the words: 'try fishball noodles at Old Airport Road???' and that's what I did. I'm not sure how I came across the simply named Teochew Fishball 潮州魚丸 stall, but I do remember the fishball uncle asking me 'nei sik mat ye?' in Cantonese. Bowled over by his friendly greeting of 'what do you wanna eat?' I went through the various options with him: wet or dry? noodle type? 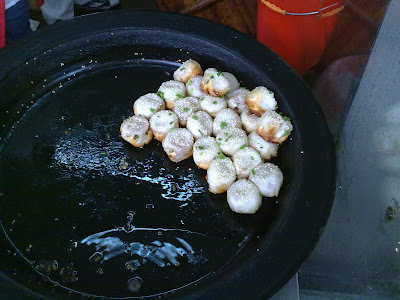 fishballs or a mix of fishballs and fishcake? I plumped for dry fishball noodles (S$3). 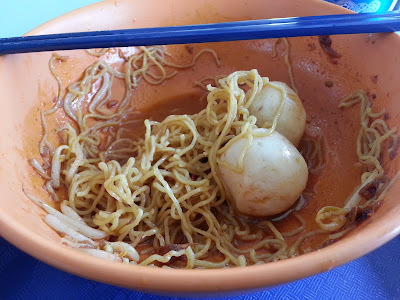 'Dry' in this context means that the fishballs are served in a separate bowl of broth (by the way the broth is pretty flavourless, as its primary purpose is to loosen up the noodles). 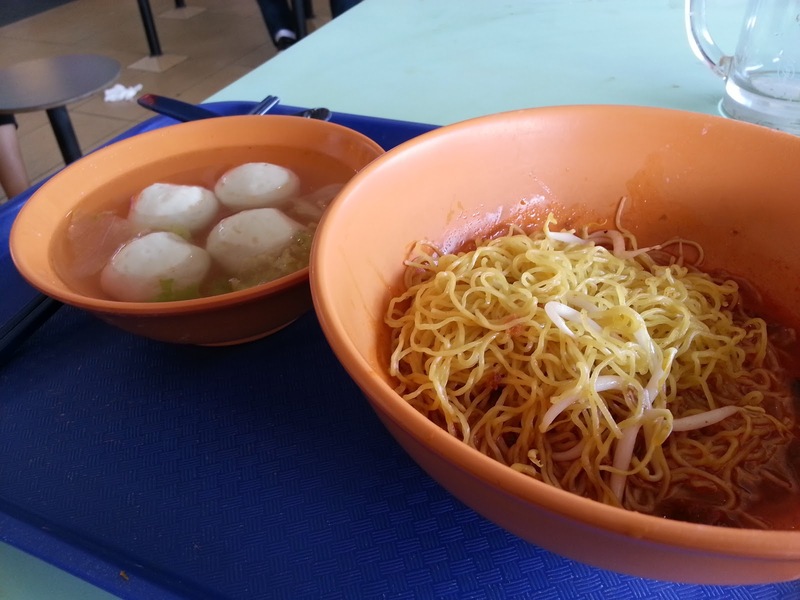 Springy is the word I would use to describe both the fishballs and thin noodles. Together with a zingy chilli dressing, this was a superior bowl of noodles. Notwithstanding the Hokkien mee fail, the noodle crawl was a great success. If I were to do it again, I would have a late breakfast at Tai Hwa (I later found out the stall opens at 9am) before going onto the other stalls at Bedok and Old Airport Road. With a 9am start and allowing for travel time, I reckon you would be all done shortly after noon. PS: Thanks once more to 面妹妹 aka Shu Han, I hope I did you proud! Go, just go. Surely the photos have already convinced you. I won't bang on about Bright Courtyard too much, but its dim sum is amongst the best in London. 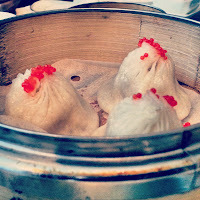 The xiao long bao were the best I've had in London whilst the har gau and scallop siu mai were top notch, too. 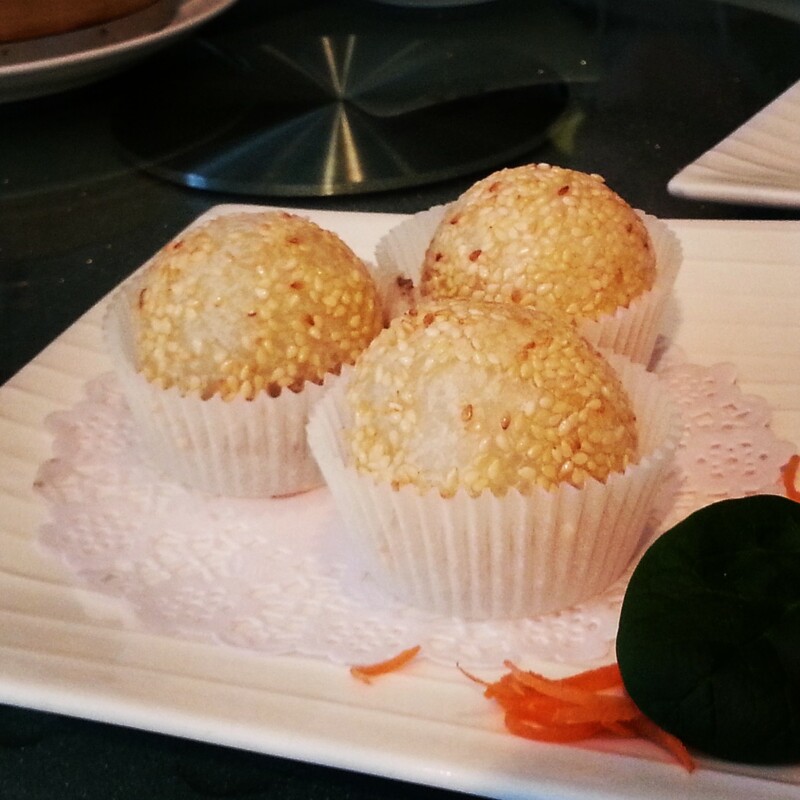 Other classics such as fried cuttlefish cake, cha siu bao and cheung fun passed muster, although the one relative let-down was the pedestrian wu gok (taro croquette). And let's not forget the braised e-fu noodles, which were also, you guessed it, pretty tasty! Going slightly off-piste, I preferred the deep-fried almond prawn balls with its soup filling to the deep-fried prawn & mango dumpling. 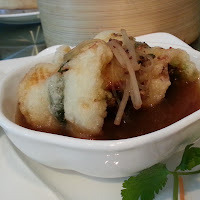 However, both were eclipsed by the exemplary sea bass roll; crispy fish wrapped around julienned mooli (and other stuff) sat in a Sichuan peppercorn-infused puddle of dressing. The sweet stuff such as snow fungus in papaya sweet soup, pumpkin dumplings and black sesame-filled balls were also of the highest quality. 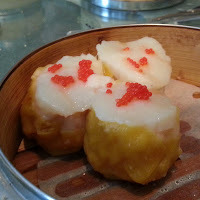 Dim sum like this doesn't come cheap with prices of individual dishes starting at around the £3.50 mark. Our bill came to roughly £30/head but if you strip out the booze then you can get away with £25/head including tea and service. 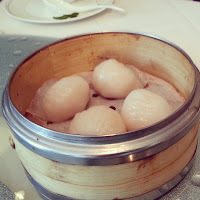 I'd also like to return here for dinner to explore the a la carte menu, which is predominantly Shanghainese in contrast to the largely Cantonese dim sum selection. PS: Special thanks to The Insatiable Eater for introducing me to this fine restaurant. I'm such a slack blogger these days. There was a time I would've knocked out a series of posts on my recent trip to Bangalore, but I really can't be arsed so you'll have to make do with just one. It's not that I ate badly, far from it, but the sheer variety left me bewildered on how to make sense of it all. For instance, I ate at places described as North Indian, South Indian, Veg, Non-veg, Punjab, Parsi, Gujarati, Rajasthani, Coastal, Railway-style, Multi-cuisine and Chinese (no, really). This scattergun approach manifested itself in one place that had minestrone and burgers on its otherwise North Indian menu. This isn't apparently unusual, as restaurateurs widen the net to pull in Bangalore's bright young things, many of who hail from other parts of India. Of the food I tried (and I tried a lot) my favourite was South Indian cuisine. In particular, I adored breakfast dishes such as a bowl of sambar ready to be dipped with idli and vada, and of course the classic masala dosa. It wasn't just breakfast, I loved mopping up all kinds of curry with various breads, pancakes and stringhoppers for lunch and dinner, too. 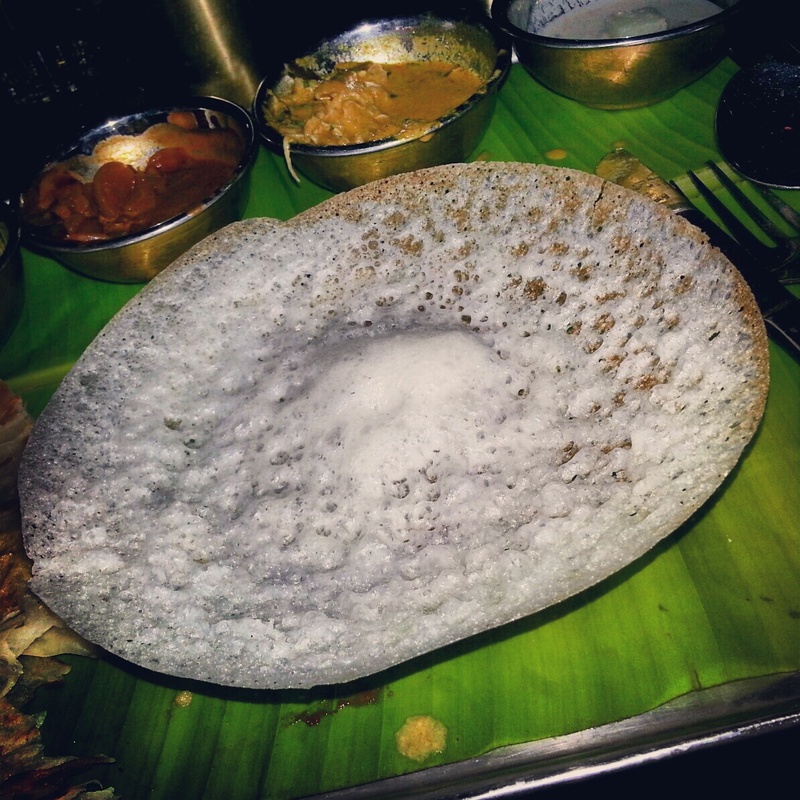 One place that does this style of food well is Karavalli (round the back of the Gateway Hotel). Don't be put off by the fact it's a hotel restaurant, as it manages to maintain a discrete identity. 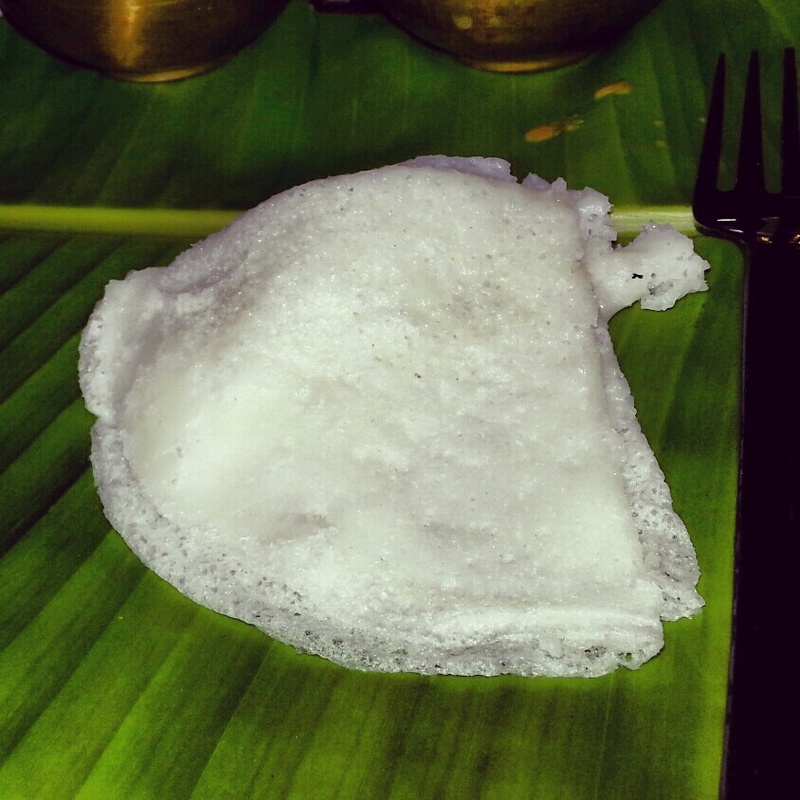 Let the waiters guide you on ordering, but make sure you order loads of appam, neer dosa and super-flaky Malabar paratha. I would love to tell you more about the curries I ate but I often didn't get to see a menu, and when I asked, the reply was 'chicken', 'fish', 'veg' etc. Having said that, I didn't have much of a clue of what I was eating when I did order at Rajdhani. 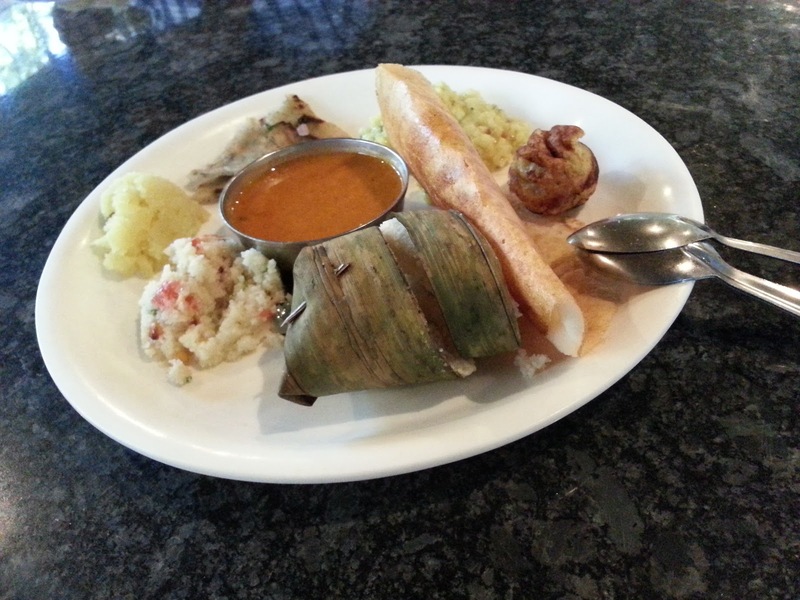 This restaurant served vegetarian thali from Rajasthan and Gujarat. Yes, that's right I am recommending a fully vegetarian restaurant in my blog. To be honest, the fact it didn't serve booze irked me more than the lack of meat and fish. 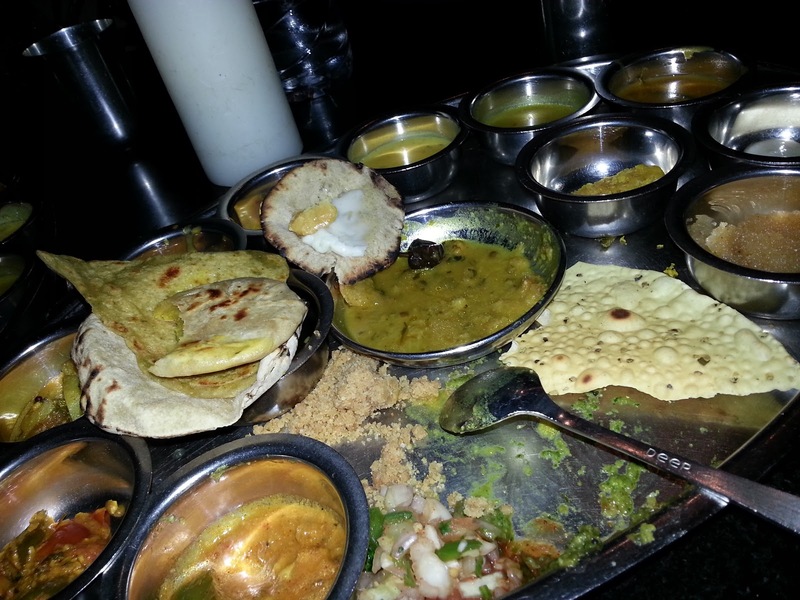 I ordered the Maharaja set thali, which consisted of countless dishes served up by blokes who buzzed around the tables with fresh pots of various curries, dhals and all kinds of stuff. A man with freshly baked breads and another guy with rice and khichuri (rice-dhal combo) did the rounds, too. Looking back, bread guy along with potato curry man came round our table most frequently. From start to finish, I enjoyed it all. 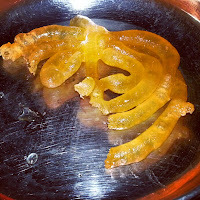 I usually found myself too full to sample Indian sweets, but on the occasions that I did, I found them too sweet. 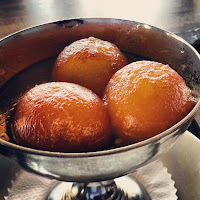 That's a shame, as I really like the idea of gulab jamun and jalebi. Quite possibly the strangest thing I ate was the local Chinese food. 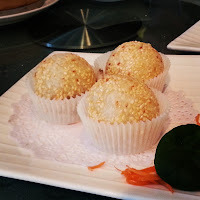 I wasn't a big fan of the couple of places I went to, as they were caught between the two stools of casual Indo-Chinese food and the real deal. Mind you, there was one dish I liked: chicken lollipops (aka Drums of Heaven in the posher places I was taken to). These spicy, tangy chicken wings were very moreish. I'm pretty sure I've barely scratched the surface of the food in Bangalore, and I wish I had the chance to explore a few more places freestyle. Having said that, I was fed well and my love of Indian food has been rekindled. If you've ever been to Shanghai then you've probably come across sheng jian bao 生煎包 - these crispy-bottomed soup filled pork buns can be found in street food stalls, cafés and restaurants all over China's largest city. 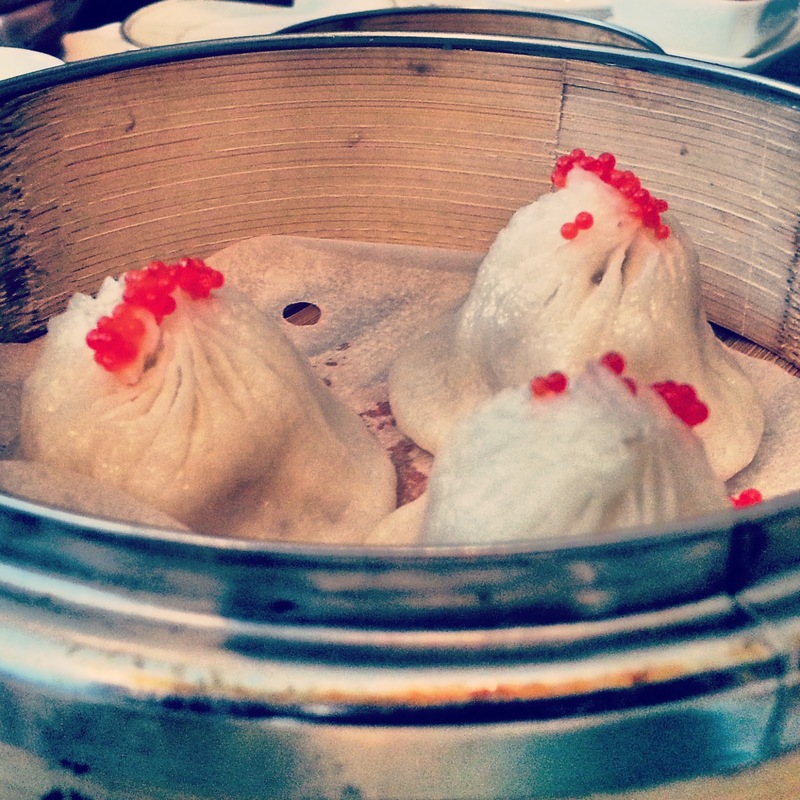 You could say, along with the better-known xiao long bao 小籠包, that these are two of Shanghai's numerous signature dishes. 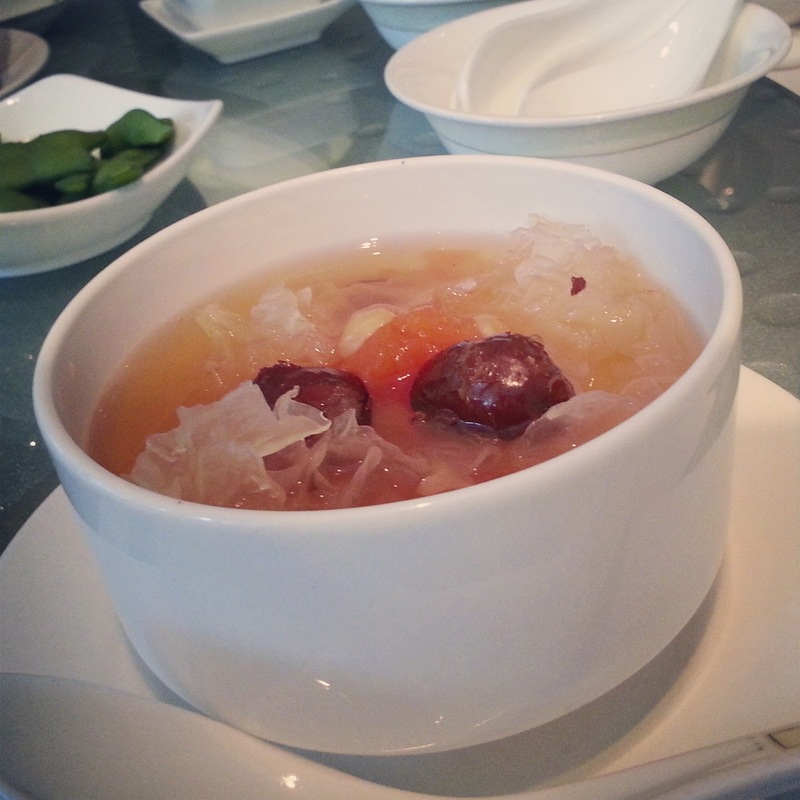 Indeed Shanghai is not alone, as many cities around the world have at least one signature dish. I'm thinking of Naples and its pizza; Beijing's crispy skinned duck; Philadelphia cheesesteak; jambalaya from New Orleans; paella Valenciana and Hakata's tonkotsu ramen. But London doesn't really have a signature dish. At this point, some of you may be screaming 'jellied eels' and 'pie & mash' at the screen, but I'm talking about contemporary London, not some 'My Fair Lady' fantasy London of yesteryear. Come to think of it, London doesn't even have a phoney signature dish such as Singapore noodles or chicken Madras. Sadder still, despite welcoming people from all around the world, there isn't a London signature dish with DNA from beyond these shores. This is particularly piss poor on the capital's part when you consider that Birmingham has its balti. But does it matter? Not really, but I think it's a bit sad (although my inner-northerner thinks it's bloody hilarious) that the capital doesn't have a dish to call its own. So let's have a crack at creating 'A Dish for London' - your ideas are needed!